Cafe-hoppers in Singapore has probably already tried Brother Bird‘s soft serve desserts that feature unique flavours of house-made soft serves with mochi bursts and doughnuts. Well friends, you’re late to the game if you haven’t heard about their new mochi croissants and cruffins (croissant + muffin). 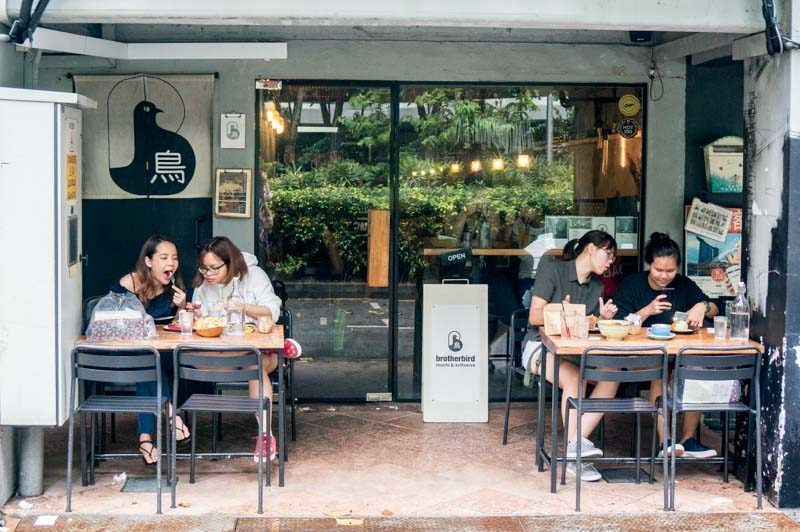 With a passion to combine mochi as an oriental ingredient into pastries, Brother Bird has three locations to grab them and go: two bakehouses located in Lavender and Bedok, as well as the ongoing pop-up at Stateland Cafe along Bali Lane in Bugis. Since I was in the area, I popped by their pop-up to get my baked goods fix. There’s cosy seating on the first level, but head up to the second floor via the stairs and you’ll be able to take a glimpse of the chefs putting the final touches on the croissants and other desserts. The homely cafe space really set the right ambience, with the aroma of fresh pastries wafting from the back of the dining area where the pop-up was set up. Croissants and cruffins fresh out of the oven were meticulously organised in rows on trays, enticing me with their golden-brown layers glazed with chocolate and dusted with sugary goodness. I’ve had my fair share of croissants, but I never thought I’d get to try mochi croissants made with a glutinous rice flour dough mix. Over a period of three days, these croissants go through a painstaking process and a lot of care. The dough mix is kneaded carefully and chilled overnight, then put through lamination where 12 layers are folded in. After being refrigerated all night, the dough is then cut, shaped into croissants and baked. Of course I had to start with their Original Mochi Croissant ($3). The shiny buttered glaze of the surface shimmered under the lights and were puffed up into swirls, resembling seashells. Thin layers of whirls were laid upon one another, living up to the love and effort that goes into each curve of the croissant. A delightful crackle emanated from a bite into the golden-brown pastry, perfectly crispy and flaky. The inside was airy yet chewy and smooth notes of warm butter with hints of sea salt coated my tongue. You can even slice the croissant in half and slot in some tuna and fresh vegetables for a DIY meal. Moving on to the Matcha White Chocolate Mochi Croissant ($4), it was half-coated in a matcha white chocolate glaze with thin barks of matcha chocolate to top it off. Like the Original Mochi Croissant, the inside of the pastry was fluffy and chewy with a mochi-like consistency when pulled apart. Initially, I thought the matcha would be overpowered by the buttery flavours of the croissant, but the mild tea accents came through with a great balance while the chocolate squares gave some texture to the overall pastry. Paying homage to our traditional snack muah chee, the Peanut Butter (muah chee-style) Mochi Croissant ($4) was dusted with crushed peanut bits and sugar crystals. Apart from the crunchy peanut bits and mild saltiness, the croissant was kept simple which allowed me to relish in the texture and buttery goodness. I do prefer simplicity but some may have expected or hoped to see a peanut butter filling with this one. Chocolate and pastries are no doubt soulmates and their Kinder Bueno Mochi Croissant ($5) thoroughly sated my chocolate cravings for the day. Streaks of dark chocolate adorned the surface and white chocolate pieces were propped on either sides of the croissant. The best part? Melted milk chocolate filled the pastry, soaking into the chewy folds. The crispy surface with the moist chocolate layers gave it a lovely contrast of texture and every munch into this pastry was heavenly. Combine croissants and muffins together and you get the cruffin. Looks-wise, their cruffins resembled tall muffins and were lightly crusted with sugar with garnishes on the top. The Lemon Meringue Cheesecake Mochi Cruffin ($5) had a fluffy meringue sitting on top of the cruffin which was torched, delineating the swirls. Once cut in half, I could see the lemon curd and cream cheese filling piped into the centre of the cruffin. It was creamy, accompanied by a gentle tang of the lemon for that citrus kick. In terms of the texture, the cruffin was slightly more dense than the mochi croissants, but the outer layers were still crispy and chewy on the inside. Be prepared for a flaky time and if I were you, I’d just eat the whole cruffin instead of going through the hassle of cutting into it. I’m not a fan of rose-flavoured desserts due to the perfume-like flavours, but I had to try their Rose & Raspberry Mochi Cruffin ($4) because of the dainty decoration of a dehydrated raspberry balanced on the crest of the cruffin. Surprisingly, the rose and raspberry water filling with cream wasn’t too overpowering but masked the soft notes of raspberry. While I hoped to have tasted more of the tartness of the berry, the curd-like filling was generously piped into the cruffin, which was chewy and fulfilling nonetheless. I can confidently say Brother Bird’s mochi croissants and cruffins were absolutely scrumptious, each meticulously baked with care and shining with personality from the unique flavours. Always up for change and creativity, their pastries undergo regular trials to incessantly indulge us with new flavours like taro (orh nee-style) and wholesome s’mores. Even as I’m writing this, I’m already craving more of these chewy, buttery, crispy baked goods. Who knows how long this pop-up will last, so go forth and try them for yourself while you can!